Lawrence faculty, staff and students come together to discuss the debate. Last Monday, Oct. 3, Hofstra University hosted the first presidential debate of 2016, pitting Republican candidate Donald Trump against Democratic candidate Hillary Clinton. The debate covered a broad range of topics, mostly dealing with the security of the nation, growth of the economy and the vision that each of the candidates have for America. After watching 90 minutes of both candidates going toe-to-toe about issues such as police brutality, creating jobs and “presidential stamina,” it is important for us to take a step back and contemplate the relevance these topics have to the Lawrence community. Out of the 41 total elections that the Lawrence campus has seen, this one is arguably one of the most important to the population at the university. Lawrence students reside in the group of voters aged 18-29. National media has been heavily emphasizing the powerful impact this group of voters can have on the election, despite the age group’s history of low turnout at the polls. The United States Census Bureau concluded that just about 45 percent of eligible voters in the 18-29 age range voted in the 2012 election between President Barack Obama and former governor of Massachusetts Mitt Romney. This is significantly pale in comparison to the 72 percent voter turnout for the 65+ age group and 67.9 percent voter turnout for the 45-64 age group. With a race as close as the one that we are now experiencing in 2016, the voter turnout of the youngest generation of voters could make a major impact on the course of the election. The actual topics discussed during the debate also reflect why this election is important to the age group that makes up the population of students at Lawrence University. Lester Holt, the moderator of the debate, started the discussion of an economic crisis in the U.S. in which financial stability for many was jeopardized. One of the biggest desires for Lawrence students and many others in college is to be able to enter the job market after four years and to find a job where they can apply their talents and live comfortably. The candidate who ultimately prevails in the election will have a strong influence on the job market. A great portion of the debate was dedicated to talking about certain social political issues such as current national conflicts for women and people of color. 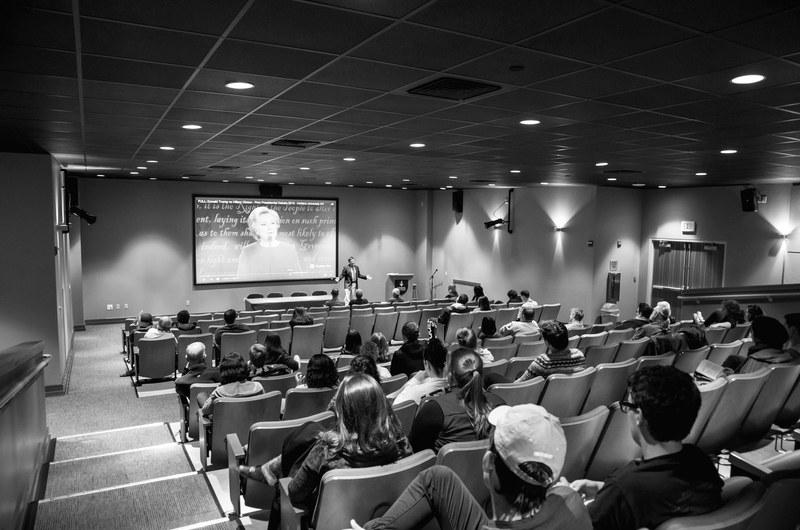 Lawrence boasts an extremely diverse student body, where a large group of students may be personally or socially affected by the issues discussed at the debate. This school year, Lawrence opened its doors to around 350 freshman, who will be in college throughout the first term of the next president of the United States. Of these 350, nearly a quarter of them identify as domestic students of color. Along with that, 13 percent of the freshman class is composed of international students from 23 different countries. On campus, this vast network of students can enjoy receiving an education without much fear of major cases of discrimination. However, in the light of recent events involving African-Americans and police brutality, there are plenty of reasons to be worried about being a young person of color in the United States. Once again, both of the candidates recognized that there is an issue with race relations in the U.S., but had very different solutions to the problem. Trump suggested the idea that the nation needs to reestablish “law and order,” and encouraged the strengthening of criminal detection practices, namely the ability for police to “stop and frisk” people who they suspect to be committing criminal acts. Despite this action being named unconstitutional in New York state, Trump stood firm behind his belief that more precautions need to be made to protect the most lives. Clinton took an opposite and much more general approach to the issue, saying that the nation needs to start making efforts to bridge the gap between police forces and the communities they serve. She stressed the importance of ensuring that the most capable and honorable people are out on the streets protecting American citizens. She discussed mental health screenings and therapy for officers who may have seen many traumatic events on duty that may lead to unnecessary violence. The debate was closed with a discussion about Hillary Clinton not having the “stamina” to be president, according to Donald Trump. The two got into a final, slightly heated debate about the role that women have in the United States and the standards that both genders are held to. Clinton was quick to point out that she has proven to have more stamina that Trump while she served as Secretary of State during the first Obama administration. She also attacked Trump with the types of words he has used to describe women in the past, and accused him of being misogynistic. Trump defended himself by simply claiming that Clinton’s accusations are false. This topic has a strong relevance on the Lawrence campus. Being a school that has a proud tradition of female education, as well as one that has been merged with an all-female Milwaukee-Downer College, Lawrence values the equality amongst all genders. More than half of the Lawrence population identifies as a female, and have all come to Lawrence to cultivate themselves as the future of the nation. This discussion about women and their strength is one that is highly controversial, and certainly has sparked the largest amount of outrage from the Lawrence community. Overall, this election is already proving to be monumental to the history of the United States, especially to those attending Lawrence University and other colleges across the nation. Looking ahead to the last few months of this election cycle, the future of this age of college students is in the hands of the voters come Nov. 8.